Down syndrome is a subject matter most us would rather not deal with. If it does not touch the circumference of our lives, why bother? And I admit I was a bit squeamish about facing a memoir about raising a Down syndrome child. But after reading Amy Silverman’s new book, a raw journalistic diary of her journey facing mothering a Down syndrome child, I feel we all can be enriched by her story. There is joy, a lot of joy in those forever children who hug too easily, who love or hate with unfiltered fervor, who take pride in achieving any vestige of "just being like everybody else." While the chances of that are slim, owing to the curse of a string of damaged genetic code, oftimes their biggest impediments are society’s misconceptions and reluctance to let them take part. Silverman deserves a standing ovation for not only having the courage to share her story, but for dealing so nobly, passionately and compassionately with the hand she was dealt. She poignantly straddles the role of mother and reporter in presenting her joyful and pained experiences raising a child with Down syndrome. Somehow that press-pass suit of armor allowed her to unabashedly share her intimate story. Her book is part therapy, part blog, part girl chat, part scientific journal. A fluid memoir that offers up some life therapy, alongside life’s miracles. 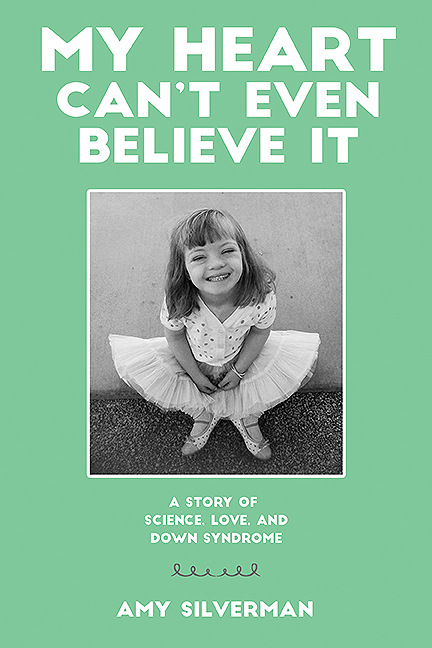 The apt title, “My Heart Can’t Even Believe It,” was derived from a lovely quote uttered by her special-needs daughter Sophie’s lips. The synopsis: Once confronted with the pained news that her baby had Down syndrome, this determined mother was doubly determined not to be the typical special-needs mom but quickly realized, what parent is? Whose comfort zone encompasses that? She had to take it one day at a time, while holding tight to the mantra, “What is a normal family anyway?” Or, best summed up by her older daughter Annabelle, Sophie’s sister, when she said, “If that’s her, that’s her.” In other words, hey, deal with it, Mom. And Amy did. It took the reporter in her to deal with the frightening avalanche of information on the health and social issues facing Down syndrome children, as well as adults. The "Patton-esque" organizer in her could strategize and battle plan the private army of services and workers she would need to pull it all off. But it took the "mom" in her to know it would somehow be alright. Sometimes one must rise to the challenge when there is no other choice, and in doing that we find we are even stronger than we ever thought imaginable. Sometimes those bends in the road take us somewhere we couldn’t have comprehended, forcing us to do things way outside our comfort zone for the ones we love. And sometimes, that’s where life actually begins. Amy Silverman’s book offers a wonderful demystification of DS for all moms and dads of Down syndrome children, as well as an education for the rest. And maybe some inspiration for those suited to making inroads on the scientific affront to this chromosomal genetic disorder.